Supernatural 8x15 "Man's Best Friend with Benefits"
Can I be perfectly honest? Is this a safe place? I may or may not have started to fall asleep during this episode, and I may or may not have not cared. Overall, honestly, kind of a throwaway episode apart from a couple bits touching on the arc of the season. I don't think you can say I'm wrong about that, but feel free if you want to do so in the comments. Brood and stare and brood and stare. Anyway, this episode is all about Dean's least favorite, or at least among his least favorite, things: witches. They get a call from some guy they've run into in the past, heretofore never mentioned as far as I'm aware, named James, who needs their help. I guess he was part of some case in the past, saved their lives, blah blah. In any event, it turns out that he didn't actually call them for help after all, it was rather a girl/dog named Portia. Now if you haven't seen the episode, you're probably thinking bzzzzaaawhatnow? Turns out, after James' brush with the supernatural, he decided he wanted to take up witchcraft for himself. Portia is now his familiar, which is basically a fancy way of saying kind of super intense companion. That can also turn into an animal, in this case, a dog. Since James has been acting weird, she decided to call up the Winchesters for help. Just how weird is he acting? Oh, you know, just having dreams about brutally murdering people, and the waking up and finding a bloody shirt in his trash. You know, no big deal. The running theory is that another witch could be controlling him, making him do these things, but no one has heard of any such thing being possible. So, duh, of course that's probably what's happening, and of course it's probably the other witch dude Spencer who says point blank he's never heard of that happening, and then looks extremely shifty. Oh, and his familiar is a cat/man that makes Dean sneeze. The part about why Spencer was targeting James is where I get fuzzy, but honestly, do we really care? 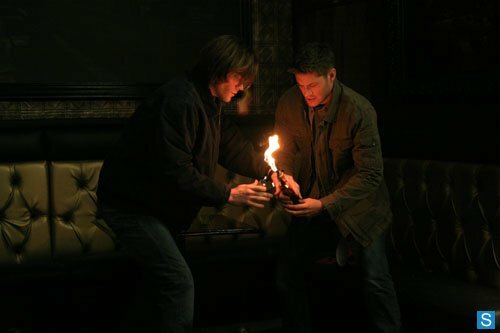 The point is, he didn't like him or wanted him out of the picture for some reason, and made him kill some people, and now the police have all of this evidence against him, so despite the Winchesters managing to kill Spencer with their special witch bomb, James and Portia are going to have to leave town anyway. Really the only bits you need to know in terms of the overall season arc are these... Dean is still worried about Sam being the only one who can complete the trials. He thinks they should find another hellhound so he can join the ranks of trial doers, but Sam is pissy about that because basically he thinks Dean doesn't trust him to get the job done. 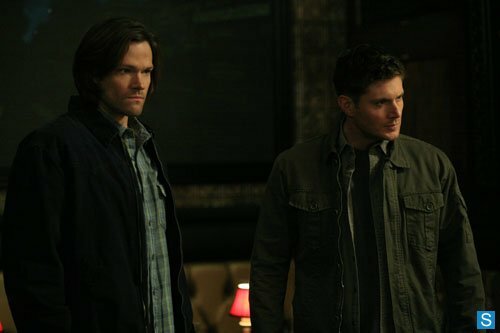 By the end of the episode, Dean decides that he does trust Sam after all, apparently because of the visions that Spencer made him see during the fight scene, and he's good with the plan. But, then, Sam's mouth starts bleeding. Dean doesn't see it, because of course Sam hides it from him, but obviously this does not bode well for dear Sammy. But honestly, if either of them dies yet again, I don't know. That's just a lot of dying and coming back to life to handle. It's only credible for so long, you know? - Dean is apparently allergic to cats? Who knew. And also doesn't like dogs. Does he like any pets? - Why were they so gung ho about going in to kill James after they had just discussed that it might not be him? I don't care that they found the shirt matched a victim's blood or that the witch dude told them there's no way a witch can control another witch, it seemed very poorly discussed and hasty decision making. - When Dean is talking about being concerned about their plan, Sam immediately draws that he's concerned about his being the one to go through the trials. That was a pretty big leap, and rather touchy, and kind of dumb. - Jared sounded like he had a cold. Random thought of random! Dean: That was incredibly hot. Sam: It was pretty hot.